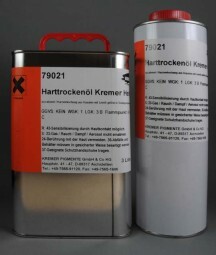 Harddrying Oil Kremer Gloss | Varnishes | Solvent-soluble Binders | Mediums, Binders & Glues | Kremer Pigments Inc. Contains 2-Butanonoxim. Can cause allergic reactions. Harddrying Oil consists of a boiled mixture of resin with linseed oil. It paints out fairly light despite its dark color in the bottle, and imparts hardness, depth and lustre to oil paints and varnishes. Other uses include: As a depth primer on wood, mortar and stone (thinned with spirits of turpentine), a weather- resistant varnish for oil colors, an additive to tempera paints and as a medium for icon painting. WARNING: COMBUSTIBLE, VAPOR HARMFUL. Contains: PETROLEUM DISTILLATES. PRECAUTIONS: Do not store or use near heat or flame. Use only with adequate ventilation. KEEP OUT OF REACH OF CHILDREN. FIRST AID TREATMENT: If inhalation symptoms occur, move to fresh air. If symptoms persist, see a physician. For further health information contact a poison control center or call 212.219-2394. Customer evaluation for "Harddrying Oil Kremer Gloss"